Weight loss is just as much mental as it is physical. If not much, much more. That is why we need to prime ourselves for successful weight loss. And better yet prime ourselves a lifetime of success in it. That is why I created this list of positive affirmations for weight loss and fat reductions. To help us obtain power over our minds and bodies. To put them both in sync so that they work together in perfect harmony. In harmonious fashion each and every day from this day forward. So that they help us achieve our weight loss goals and aspirations. You have all that it takes right now, friend. To get the perfect body and keep it. And better yet transform your entire existence because of it. YOU have what it takes. If anyone has done it before, that means you can do it. You can truly take the power back and see progress in every single area of your life. Including weight loss. Remember to commit fully to this process. DECIDE today that you will do WHATEVER it takes to get to your ideal weight. As the true definition of decision in Latin comes from the world INCISION. Which means to cut off all other possibilities. You will simply DO IT UNTIL. No other way out. You will read the books, think these positive affirmations. And you will consistently make the right choices that will allow you to arrive to a place of complete victory. And better yet, high levels of self satisfaction. Which comes from knowing that you did whatever it took to reach your goal. At this point you transcend your smaller self. You emerge anew and transformed. Never even mentally or physically capable of going back to the old you. As you are bigger and stronger than you ever were. 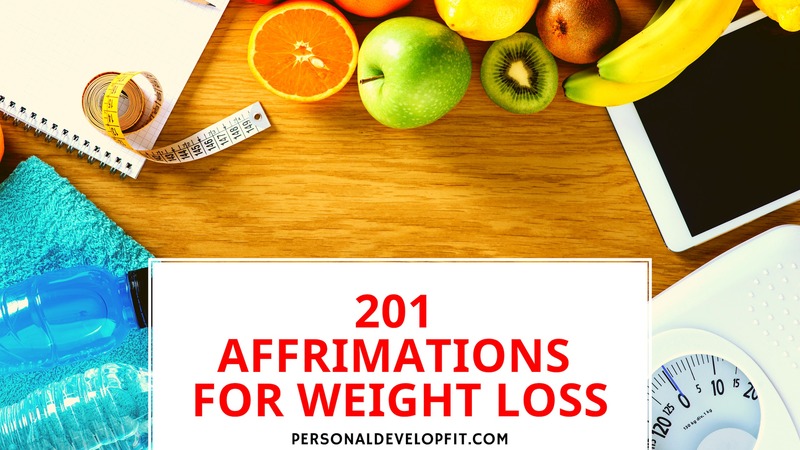 Here is a list of weight loss affirmations that can get you started. And keep you going in the right direction. In the most effective and positive way possible! I am fit and confident in my own body. I make choices with ease that support my weight loss journey. All the people around me are in complete support of my weight loss. I always envision myself at my ideal weight. I have all that it takes to lose weight and achieve my ideal body weight. Weight loss is as easy and natural for me as breathing in and out. I am naturally raising the standard on myself and my health. I love the idea of me being at maintaining my perfect body weight with ease. All the weight I lose, I lose permanently. I love my body completely right, which helps me in my journey of losing weight. I burn fat with ease. I listen to what my body tells me it needs. I am intensely driven toward achieving my weight loss goal. I commit to a new lifestyle that is beneficial not only for weight loss but for higher self confidence and self esteem. I love going to the gym and eating healthy. I sink into deep states of sleep and relaxation, helping my body recover perfectly each day. I easily let go of relationships that don’t benefit my weight loss and health. I naturally read and watching content that helps me gain knowledge and ideas for effective weight loss. I fully commit to getting down to my ideal body weight. I dwell on all the long term positive effects that my weight loss will bring me, and it inspires me! I set realistic but challenging goals for myself that inspire me to lose weight and feel great. My focus and drive never wavers on my weight loss journey. My heart and soul is so passionate and driven toward achieving my weight loss goals. It is perfectly clear to me how all the positives about weight loss outweigh the negative. I am grateful for this new lifestyle change and love losing weight. Not only is my health improving, but so is my entire life. And it feels great! I trust myself fully and completely to make the right choices that create great weight loss. I love and embrace the weight loss journey, enjoying every single step of the way. My thoughts are constantly positive and revolve around positive images of me being fit and healthy. I share with people my insights and tips for weight loss as I know they reinforce my new beliefs. I give thanks for having a body that is capable of exercising and effectively losing weight. I am so thankful that there are so many tools and tips that I can use to get me fit for life. Each and every cell in me feels healthy and vibrant. I am in complete control of my weight. I easily work my workouts and exercise around my work and life schedule. I tell my body and mind what to do. Not the other way around. I am arriving closer and closer each day to my perfect weight. Every day is a new day to begin on a positive and stable foot. I naturally eat in perfect and proper proportions. I pay no attention to people telling me my goals aren’t possible. I do not listen to they naysayers and haters. I continue on with optimism and hope, knowing my weight loss goals are attainable. My core values are around my fitness and weight loss journey, helping me naturally make great choices. I am craving healthy and whole foods more and more each day. Working out comes natural to me. I am becoming more physically active each day. I see food as fuel, not as something to suppress emotions with. My metabolism is high and effective at burning fat and helping with weight loss. I love the journey of health and commit to a lifestyle change, not just a diet plan. It is who I am now and forever. I am literally watching fat melt of my body, more and more by the day. I commit to loving myself throughout this entire journey. It is safe for me to change my body. My cardiovascular system is running perfectly, helping me reach my weight loss goals with ease. I prioritize working for progress and not perfection. Everyone is different and I don’t hold any expectations to my weight loss, only that it is and will keep happening. The whole universe conspires to help me with my weight loss and fat loss. I inspire people with my dedication and commitment to fitness and weight loss. I belief in my abilities and know I have what it takes to transform my body and mind. I love setting new goals for myself that keep me inspired and motivated to keep going with my weight loss. I am mastering my weight loss and health more and more each day. I listen to my body when it tells me I need to eat, I do not eat out of boredom. All my feelings and emotions are predicated around my weight loss. Even in my dreams, ideas and inspiration come to me about weight loss. I am never ashamed about my journey, I move at a pace perfect for my body. I commit to losing weight slowly and in a healthy manner. For this is the key to long term sustainable weight loss. There is no one on this earth stronger and more driven than me. I shoot for progress instead of perfection. I am guided by the universe which guides me easily and directly to better and more effective weight loss. I take joy in seeing my body transform and my clothes fit better. Losing weight and fat is becoming easier for me each and every day. I can feel a great internal shift in my body and mind that feels so positive. If I get off track, I do not beat myself up. I simply get right back on the wagon with a high level of optimism. I am getting closer and closer to my ideal weight with each day. I naturally eat only what I need for my weight loss, not the entire plate. I easily pre-prep my meals each week to help create effective weight loss and a healthier body. I am not longer needing extra weight to protect me. I feel safe and protected by my strong new self. I have all the mental and physical power needed for effective and long lasting weight loss. My fat loss is progressing each day, and progress feels so great! Whenever I look in the mirror, all I see is myself at my perfect body weight as well as a champion and a warrior. I only think about my past accomplishments when my mind tries to sabotage me. I follow the best fitness and diet influencers and coaches online and on social media. I love myself completely and love living in this amazing body. Eating good helps me heal my body completely. Giving me full restoration. When I wake up, I only think about positive thoughts about my weight loss journey. Changing my old habits is becoming easier and easier every day. My health and wellness is improving on a consistent and daily basis. I only dwell on the positive aspects of weight loss. I find a big enough reason WHY I want to lose weight. Strong enough to pull me through the tough times. I have no fear of saying no to foods and people when I need to do so. I am a winner, and I will not stop until I win. I naturally attract into my life the perfect people to help my with my weight loss. I allow my intuition to guide me in the process of better health and weight loss. I love challenging my body and mind through fitness and better health choices. My body adapts quickly and well to the new choices I am making for my health and wellness. I literally have no question in my mind that I am doing the right thing and will reach my goals. I look at weight loss as a marathon, not a sprint. Therefore I naturally make decisions that are for the long term benefit of my health. I always and only focus on the positive aspects of my weight loss journey. My gift to myself is this strong, sturdy and healthy body and lifestyle. I feel thankful for the gift of health and fitness that is becoming such a big part of my life. I am inspired by seeing my muscles toning up. With each ounce and pound of fat I lose, my confidence and motivation soars higher and higher. I am awaking the giant within me through this journey of weight loss. I always get so encouraged and inspired by my progress which carries me onto the next win. I naturally discover more healthy foods that I enjoy and help with my weight loss. I am OK with starting with baby steps for I know they will turn into running strides soon enough. I naturally see weight loss and fitness as a journey, not a destination. My body works perfectly, eliminating and detoxifying, helping me lose weight quickly and effectively. My desire for bad foods are dissolving more and more each day. I love the way my body functions. It feels strong and healthy. I naturally make friends who are on the same journey as me. They serve as great accountability partners for my journey. I know my mind is powerful, so I naturally listen and watch things that strengthen my mind. Helping my weight loss journey. I reward myself in a positive manner with each little and big win I have. I love the way my whole life has transformed though my successful commitment to weight loss. Each neurotransmitter in my body is fire optimally helping me feel great all day and have ample amounts of energy. I love the feeling of transformations that is happening inside and outside the gym. I love fitting in at the gym and making new and positive friends there. I naturally engage in acts that help me burn more calories. I laugh in the face of challenges along my weight loss journey. I let go of all my limiting beliefs around weight loss and failure in the past. I know that failure is only feedback. I learn from my weight loss failures and use them to make me more successful. The people in my life are so encouraging about my weight loss and how great I look from my weight loss. I naturally ignore hunger pangs and do good things when they arrive like mediate or hydrate myself. I am looking better and better naked each day. My old bad habits naturally fall away and are replaced with healthy habits that make my weight loss journey easy. No one on this earth has ever been more blessed on their weight loss journey. I naturally coach myself on this journey and am easily able to motivate myself to keep going strong. It is becoming so easy for me to say no to unhealthy foods. I am passionate about health and wellness. I find new inspiration every day which helps we with my weight loss. I feel at peace with myself when I commit to weight loss. And it feels damn amazing! I am finding it nice that I can’t wait to go to the gym each day. I now find weight loss and fitness easy to engage in when I used to find it hard. I lose myself in the possibilities for myself, especially my pertaining my weight loss. I find great people to keep me accountable for my goals. Nothing and no one can stop me on this journey. I see, feel and hear everything that I would if I were already at my perfect weight. I feel great and look great as my body is slimming down. I look in the mirror and see a champion. Never engaging in negative self talk. I see a thinner me in the mirror. My body and mind feel and are in perfect sync, helping me strive hard towards my fat reduction goals. I place emphasis on how my clothes are fitting, easily paying no mind to what the scale says. I feel confident and powerful in my body. I love waking up in the morning thinking about all the possibilities for me that the day holds. I look slim and slender and toned, like an athlete. And I love it! Strangers and people I know always encourage me about my fitness and weight loss. Any progress is good progress, now matter how little or how big. I feel like there is nothing I can’t do in this life. I am truly limitless. My clothes are fitting so great on me as I am reducing my weight. All I know now is perfect health and wellness. I do not fall for fad diets or gimmicks. I know they never give long term sustainable results. I focus on all the positive things my weight loss is bringing me. I engage in weight loss for the betterment of my mind and body and for me, not anyone else. I let go of all the guilt and negative emotions that are revolved around food, right now! I am looking so fantastic in these new clothes I have to by because my old ones don’t fit anymore! I inhale wellness, and exhale fat loss. I naturally eat whole and nourishing foods that provide me with the nutrients I need to feel great and lose fat. It feels great to be becoming the best version of myself. Through my fat loss pursuits, I have gained momentum and made positive changes in every area of my life! I naturally chew my food completely which helps me feel full with less food. My digestive track works perfectly, aiding in fast and effective weight loss. Unhealthy foods just don’t taste good anymore. I realize how unhealthy food doesn’t make me feel good or confident so I easily let go of my eating habits surrounding bad foods. I exert massive gratitude and respect to myself and my body each day for it is the temple that I will live in forever. I am literally in awe of my progress and how far I have came with my weight loss. God is supporting and helping my weight loss journey. Making me feel that I am not alone in my journey. I see the best in myself and know I am powerful and able to achieve perfect health and wellness. I have hope and certainty for my future body and weight loss goals. I am so grateful for my body and how it works to help me with my weight loss goals. I am enjoying new friendships with people who are moving with me along this journey. I perfect and master my eating habits more and more each day with more ease. My new found weight loss and habit changes is giving me an unstoppable and high level of self confidence. I treat my body with the upmost respect. I feel great inside this new and improved body. I believe in myself, even when times get tough. I push on. I already feel the way I would feel if I attained my perfect body weight. I am completely open to the best techniques and help to achieve my ideal body weight. I am becoming more and more athletic each day. My body is becoming more svelte and slender by the day. I completely let go of all desires and urges to critique or judge my body or weight loss journey. I am fit for life. I feel powerful in and out of the gym. I walk, talk, think, speak and eat my goals and dreams of weight loss. I am a walking and talking representation of someone who sticks to their weight loss journey impeccably. I find humor and joy in my weight loss journey constantly. I marvel constantly on how far I have come on my weight loss journey and it makes me feel proud. I give myself more and more verbal and non verbal recognition by the day. I am constantly finding active things that I really like to do, which helps me lose weight. I let go of eating foods that are empty in calories for they no longer benefit me. I see habits that sabotage my weight loss and easily let go of them. People are always checking in with me and encouraging me to reach my ideal weight. I have no shame in telling people my goals for I know I reinforce them when I speak them to others. So there we have it! 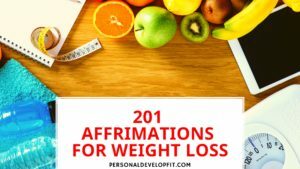 A list of affirmations for fat loss and weight reduction. I hope it helped you see that there are tools that we can use to really hit our weight loss goals. Tools outside of simply trying to go to the gym and eat better. Motivation will only last so long. But by programming your mind and body through affirming empowering beliefs, you can transform your existence. Share with me what your favorite health affirmations really resonated with you and your journey. And also if you have anything to add. Or any good affirmations for health that I may have missed that can be beneficial for us all.